For any booking made directly through our website, each guest will be offered a complimentary one-hour massage by one of our expert massage therapists in one of our private spa pavilions at Karpaha Sands Spa. See "Rates" for details. 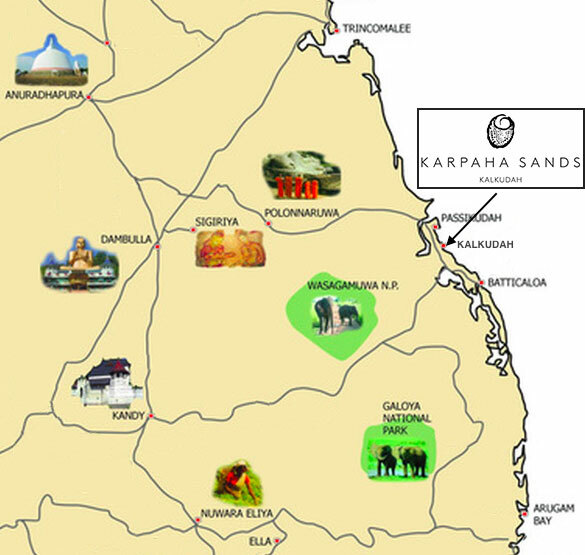 Ideally located on one of the most beautiful beaches in the country, just 1 hour from Polonnaruwa, Sri Lanka’s most fascinating capital, Karpaha Sands is your ideal beach stop in any itinerary combining the cultural and natural treasures of Sri Lanka, between the Cultural Triangle and the Central Mountains or Yala NP. Take Road A11 until you pass mile post 127. At the large round about of the Thirukkondaiadimadu Junction, turn right towards Batticaloa on Road A15 (Trincomalee-Batticaloa Road) until you pass mile post 28. Between mile post 28 and 27, pass the Kumburumulai Junction on your left with hotel boards indicating a turn on the left to Passikudah. Continue straight for 1 km and turn on your left onto the cement road at the “Karapaha Sands” signboard / Kiran junction. 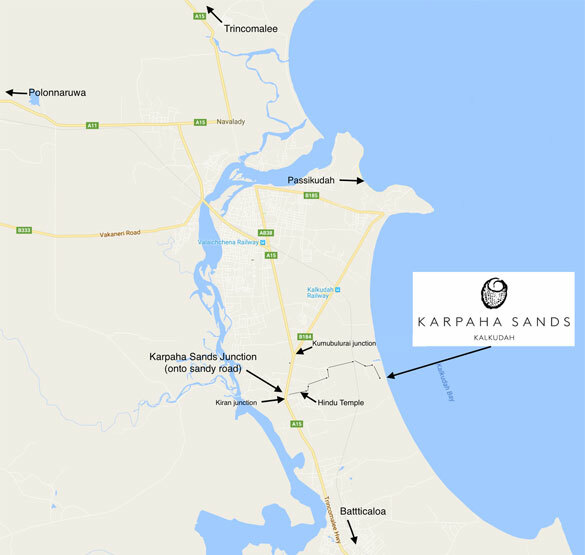 As you drive on this small road, follow the “Karpaha Sands” signboards for about 3km, leaving a Hindu temple on your right, then driving on a red soil unpaved road and passing the railway track. The entrance is about 1km after the railway crossing. Please be careful when crossing the railway line. Take Road A15 south towards Batticaloa for approximately till you reach Thirukkondaiadimadu Junction, then follow directions above (“From Polonnaruwa”). Take Road A15 north towards Trincomalee, pass Eravur and Kiran Villages. Pass mile post 27, and 100m after the Oviya guesthouse (on your left), turn right onto the red soil unpaved road at the “Karapaha Sands” and “Cashew Corporation Estate Board” signboards (if you reach the Kumburumulai Junction on your right with countless hotel boards indicating a turn on the right to Passikudah, you have just missed the dirt road). Then follow directions in the “From Polonnaruwa” section. Three plane options currently available. • Fly Southern flies to Batticaloa Airport, currently 3 times a week, Tue, Fri, Sun from Ratmalana Airport. This is a cost effective option with landing in the airport closest to Karpaha Sands. • Helitours flies 3 times a week (Mon, Wed, Fri) to Trincomalee which is a 1.5hour drive from Karpaha Sands. Ratmalana Airport, South of Colombo, is about 40 km / 2 hours away from Bandaranaike International Airport. Take the Expressway until Bandaranaike International Airport, then follow the main road Kurunegala-Dambulla-Habarana-Polonnaruwa, and finally the instructions “From Polonnaruwa”. Travel by car or minivan from Bandaranaike International Airport takes 5-6 hours and can comfortably be made overnight for flights landing in the evening with an early morning arrival at Karpaha Sands for a beautiful sunrise. We can arrange pick-up at the airport and day or overnight transfers upon request.